Patricia Kamara was born in the late 1960s in the Utopia region called Anerara. This is located approximately 300km north east of Alice Springs, Northern Territory. Patricia has a close friendship to the well-known Petyarre family. 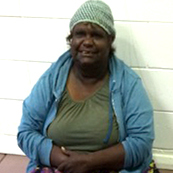 Patricia primarily paints stories associated with bush medicine seeds from the Central Australia region.